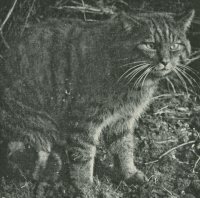 To see the real Wild Cat to-day, we must seek it in Scotland, preferably in the wild, rocky parts from the counties of Ross and Inverness down to central Perthshire, where it is said to have increased its numbers considerably in recent years. It inhabits the most lonely and inaccessible mountain sides, hiding during the day in some rocky fastness, prowling far and wide at night in search of prey. It is of a general yellowish grey colour, but individuals differ in their dark brown markings, some having vertical stripes running down the sides ; in others these are broken up to form spots. It has a squarish thick head and body, the latter longer than in the domestic cat ; but the thick bushy tail is relatively shorter, ringed, and ending in a long black brush. The limbs, too, are longer than those of the tame cat, so that it stands higher. A pair of dark stripes extend from the eyes and over the head to behind the ears. The fur is long, soft, and thick. The average length is about two feet nine inches, of which the tail accounts for eleven inches ; but there is a record of a Scottish example measuring three feet nine inches in all. Pennant (1776) says "This animal may be called the British tiger; it is the fiercest, and most destructive beast we have ; making dreadful havoke among our poultry, lambs, and kids." C. St. John, nearer to our own time (1845), says its strength and ferocity when hard pressed are perfectly astonishing. He adds " I have heard their wild and unearthly cry echo far in the quiet night as they answer and call to each other. I do not know a more harsh and unpleasant cry than that of the Wild Cat." The female makes a nest in some remote rock-cleft or hollow tree, where in early summer she usually brings forth four or five kittens, which at an early age spit angrily at any intruder. The distribution of the Wild Cat includes Europe and Northern Asia to the North Himalaya. Though formerly a beast of chase in England, it appears never to have been a native of Ireland.